This week we will report on a conference attended by a member of our staff, Senior Curator of Archaeology, Kurt W. Carr. One of his main research interests is the Paleoindian Period beginning with the entrance of humans into the New World. Last weekend, October 16th -19th, he had the privilege of representing The State Museum of Pennsylvania at a meeting in Santa Fe, New Mexico that was devoted to Paleoindian studies. 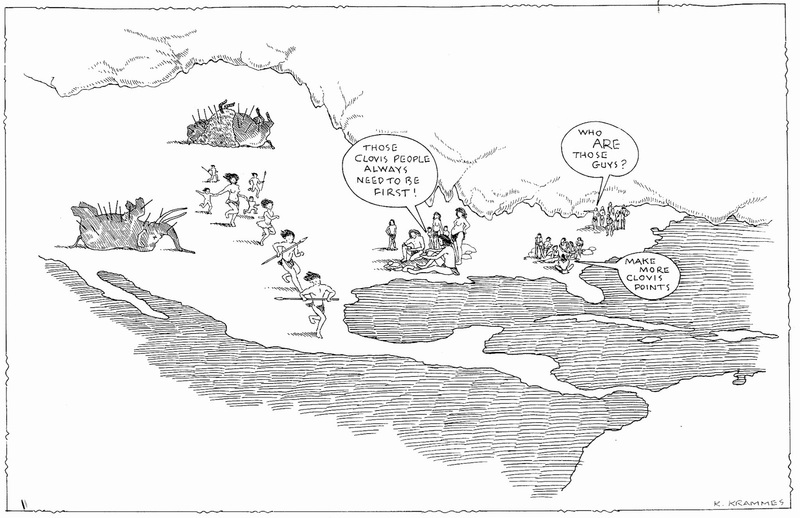 Since 1987 five international conferences were held that address significant issues on the peopling of the New World. These include presentations by experts from North and South American and East Asia. Their focus is on archaeology but include environmental studies, linguistics and DNA studies. The earliest example was the Columbian Quincentenary Symposium sponsored by the Smithsonian Institution in 1987. Later conferences were sponsored by the Center for the Study of the First Americans; The First World Summit in 1989; Clovis and Beyond in 1999, Southeastern Paleoamerican Survey in 2005 and Paleoamerican Odyssey in 2013. These conferences have followed a similar format that includes thirty minute oral presentations in a large auditorium by professionals, poster sessions and an exhibit room featuring significant artifacts and faunal remains. Interest in this conference has grown significantly over the past 25 years, with over 1200 in attendance this year. Participants reviewed more than 190 posters in an open forum which allowed them to engage in lively discussion with researchers. Conference presentations and discussion frequently extended into the evening. . Obviously, professional archaeologists represent the majority of attendees but students and amateur archaeologist are also present in large numbers. Amateur archaeologists are also in attendance and many have made significant contributions to Paleoindian studies. They frequently are credited with discovering important archaeological sites. Dr. Kurt Carr with friend and colleague, Kirk Spur discussing Kurt's poster. Jon Lothrop presents his poster on Paleoindian artifacts from New York state. 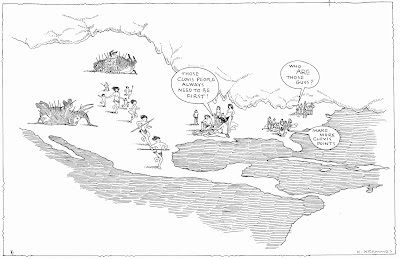 Although the state of knowledge concerning the first Americans has evolved, the main themes in these meetings are paleo-environmental reconstruction, the archaeology of Siberia, the migration routes taken by the first Americans to get to North America, the dating of the earliest human expansion out of Siberia (20,000 or 12,000 years ago) and the rate of movement once in the New World (moving to the tip of South America in 1000 years or 5000 years). Focus is also drawn to the evolution of technology between the Old and New World (flake tools or blade tools), the Clovis adaptation (one culture or many cultures sharing a distinctive artifact type), and subsistence (specialized big game hunters or generalized foragers, the biology of the first Americans and lastly, the evolution of Indian languages. Many Russian archaeologists attended the conference in 1989 and everyone was anxious to learn if fluted points had been discovered in Siberia. It turns out that no fluted points have been found west of Beringia. Beringia is an area of our world that is partly in Russia, partly in Alaska and partly in Canada. 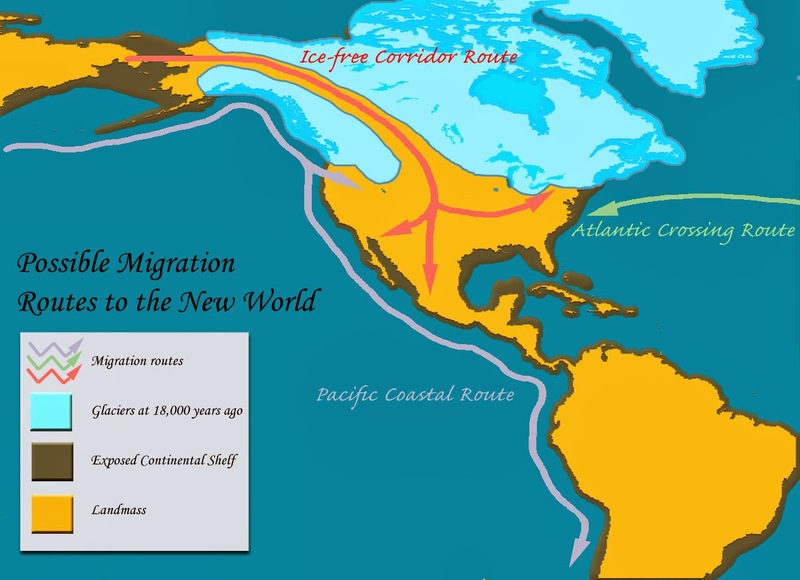 Archaeologists have determined that the fluted points discovered in Alaska were brought by groups migrating from the south. The consensus is that fluting was invented either in the Southwest or the Southeastern United States. At the 1999 conference, there was considerable and sometimes acrimonious debate concerning the entrance date of people into the New World (Pre-Clovis vs. Clovis). At the 2013 meeting, there seems to be a general consensus that humans were expanding out of Siberia into North America by at least 14,000 years ago and probably as early as 18,000 years ago. Some of these groups may have failed or became extinct. For decades the “ice free corridor” located between the Rocky Mountains and the Laurentide Ice Sheet over Hudson Bay was the favored route south from Alaska and emerging onto the northern Great Plains. This assumption fell out of favor at the 1999 conference and was replaced by a Pacific coastal route involving travel by boats. This year, it was suggested that both routes may have been used by North America’s first inhabitants. Conference attendees listened to over 50 presentations. The auditorium could seat all 1200 attendees who listened to over fifty oral presentations. The following is a short summary. Vladimir Pitulko et al. reported on the Yena site in Siberia. This is the oldest site above the Arctic Circle and dates to 30,000 BP. 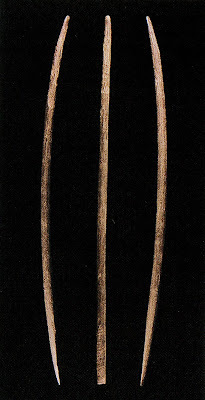 It is characterized by a blade tool technology and also illustrates a very sophisticated bone, antler and ivory technology including a rhinoceros horn foreshaft for a spear. This is one of the earliest sites in Siberia and marks the earliest date for when the expansion into Beringia may have begun. 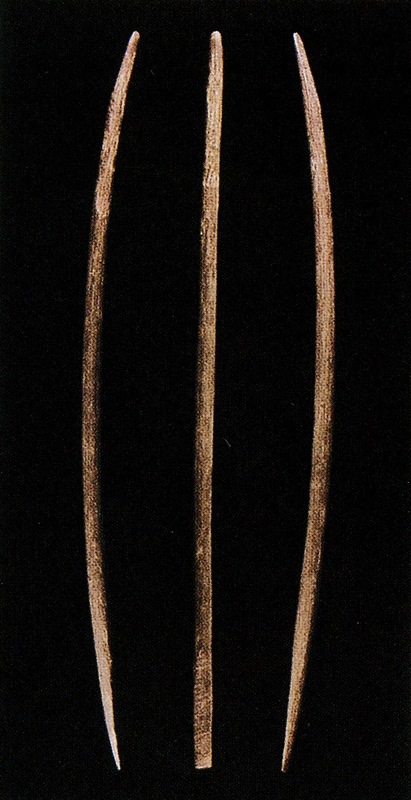 Spear foreshafts found at Yana, a site 500 km(about 300 miles) north of the Arctic Circle in eastern Siberia. these rhino horn foreshafts were fitted to the front end of the spear. If a hunter struck and animal without killing it, he could remove his spear, fit a second foreshaft to the spear, and reuse it. Credit- The Yana RHS site:Humans in the Arctic before the last glacial maximum, Science, 303:52-56. During the Ice Age, sea levels dropped over two hundred feet, exposing much of the continental shelf along our coastal margins. This would have been occupied by the first people entering the New World and may have been their main entrance route down the Pacific coast. In fact, there has been some success at finding Paleoindian materials along the coast of Florida. Quentin Mackie et al. discussed the search for submerged sites along the Northwest Coast of North America which has not yet been successful. Dennis Stanford et al. reported on five sites in the Chesapeake Bay area that date to over 20,000 years ago. He believes these archaeological sites demonstrate a migration of people from Europe. His presentation was followed by Connie Mulligan and Andrew Kitchen who used DNA analysis to develop a model for human expansion out of Siberia and into North America. Contrary to Stanford et al. 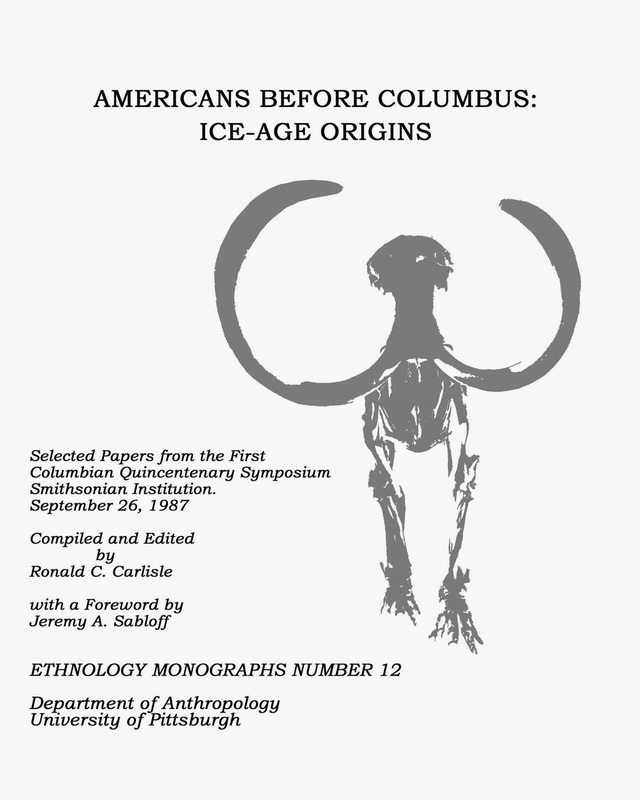 they did not recognize any biological connections with Ice Age European populations. David Anderson et al. has been mapping the distribution of fluted points in North America and used the data base (Paleoindian Database of the Americas which is available on-line) to develop a number of possible migration routes into North and South America. A common theme that has been repeated at all four of the Paleoamerican conferences is that the data from South America, documented by South America archaeologists is ignored by North American archaeologists. The reasons include the language barrier (more Americans need to be bilingual) but clearly; North American archaeologists do not respect their colleagues south of the border. By all accounts, the Paleoindian period in South America is represented by different types of tools and the oldest sites clearly date prior to many of the fluted point sites to the north. There is no question that there were people here prior to Clovis based on the South American sites and those archaeologists are curious as to why it is even a point of discussion among North American archaeologists. For decades, archaeologists have pondered the function of fluting. Why spend so much time fluting projectile points when this results in as much as a 20% failure rate. Bruce Bradley and Michael Collins gave one of the most controversial but innovative presentations. They characterized fluting as part of a revitalization movement. It had a purely symbolic meaning and was part of a response to stress caused by climate change. The Paleoindians were responding to increasing sea level rise and the extinction of the megafauna which had been an important food source. Sounds familiar and who says that archaeology can’t make a contribution to our modern world. This presentation was followed by Nicole Waguespack who discussed the various hypotheses concerning the Pleistocene extinction and concluded that it was driven by human predation. 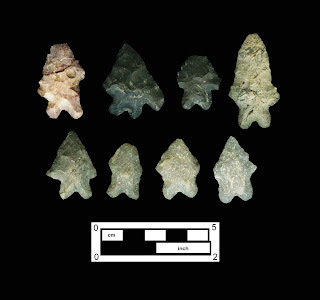 Finally, Jim Adovasio from Mercyhurst College, who has conducted extensive research at Meadowcroft Rockshelter in southwestern Pennsylvania, reviewed the evidence for a Pre-Clovis occupation in the New World. Based on analysis of the most recent discoveries dating to this time period, he concluded that people were in North America by at least 16,000 years ago. 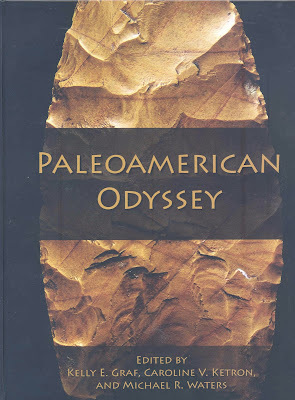 The Paleoamerican Odyssey conference was remarkable in many ways, not the least of which is that all of the papers presented were published in book form and was available at the conference. Considering that procrastination is a common characteristic of many archaeologists, this was amazing. In retrospect, archaeology is truly making progress in the search for answers concerning the culture of the first people in the New World. The opportunity to share and discuss research with other scientists is essential for the advancement of our investigations into migration and settlement of the Americas. We have a long way to go but conferences like these help to summarize this progress and add direction for future research. 2013 The Chesapeake Bifaces: Evidence for an LGM Occupation of the Mid-Atlantic region of North America? We have been writing the last few weeks about all of the programming for Archaeology Month and the many opportunities available to learn about the archaeology of your community. If you haven’t attended a program yet, there are still a few venues remaining that you should consider attending. This week our focus is on the Workshops in Archaeology program which will be held on November 16th at The State Museum of Pennsylvania. There is a link-2013 Workshops in Archaeology on the upper right side of our page to the full program brochure and registration form. This year’s theme is the Archaeology of A Troubled Nation, 1775-1865. This was a pivotal time in our Nation’s history and Pennsylvania played key roles in the events of this period. 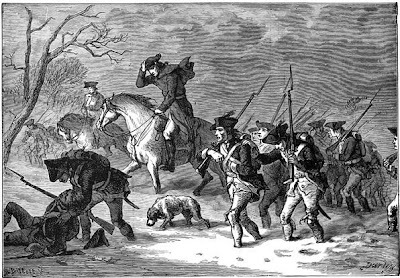 Beginning with the American Revolution our commonwealth contributed both industrial supplies and manpower to the conflicts and development of our Nation. Philadelphia was the largest city in British North America with a population of nearly 30,000 residents. The colony was a diverse mix of English, Germans and Scots-Irish with a broad range of religious practices. The social dynamics of Pennsylvania is important in understanding its initial reluctance to join the War for Independence. An internal revolution had just occurred here that replaced a hierarchical colonial society under the rule of the Penn family and their ties to the British monarchy, to a freer democratic state constitution. This break from Penn family rule and its Quaker pacifist tradition empowered the Scots-Irish on the western frontier and led to radical movements to break from British rule. The abundance of raw materials in Pennsylvania had played an important role in commerce with England, and the resistance to pay taxes prompted the call to arms. Philadelphia served as the nation’s capital during most of the American Revolution. It was viewed by British forces as significant for multiple reasons and thus their desire to take control of the city. The Workshops in Archaeology program will begin with archaeology conducted on sites impacted during the American Revolutionary War. The Continental Powder Works was constructed in April of 1776 to provide gun powder and arms to the colonial troops. Wade Catts, Archaeologist at John Milner and Associates, will share results from recent archaeological investigations conducted here to find the remains of this site which was destroyed by British troops in September of 1777. Attempts by Pennsylvania to control the advance of British forces included the installation of a line of defense in the Delaware River from 1776 to August of 1777. A series of chevaux de frise were sunk between Fort Mercer and Fort Mifflin. These lines of defense were comprised of a series of long wooden posts with large iron spikes at the tip used to puncture the hull of large sailing vessels. When Howe took control of Philadelphia in September of 1777 he soon realized the difficulty of navigating through the maze of this line of defense. Howe was eventually successful in maneuvering through and forced the abandonment of Fort Mifflin and the retreat of George Washington’s troops to Valley Forge. Janet Johnson, Curator at The State Museum, will share the recent discovery of a chaval de frise (singular of chevaux) near Bristol, Pennsylvania and conservation efforts currently in process to preserve this important artifact of the American Revolution. David Orr, Professor at Temple University, will discuss the archaeology conducted at Valley Forge and the significant contributions that archaeology has provided for interpretation and understanding of this important site. Washington’s men camped here from December of 1777 to June of 1778. Archaeologists have researched the evidence left from this encampment to improve our understanding of this difficult time in American history. Steve Warfel, retired Senior Curator of The State Museum, will discuss evidence of a Revolutionary War Hospital at Ephrata Cloister in Lancaster County. This hospital was established to care for soldiers who were wounded and sick from conditions at Valley Forge. Learn how excavations at a German religious communal site yielded evidence of these Revolutionary War soldiers. Pennsylvania continued to play a decisive role in western expansion and the War of 1812 would find us once again at the forefront of Nation building. 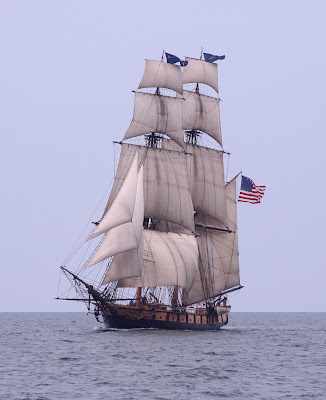 The Battle of Lake Erie in September of 1813 saw the defeat of the British Navy at Put-in-Bay and gave control of the Great Lakes to the United States, eliminating the threat on the northwestern frontier from British forces. The flagship Niagara was hastily built to serve during this battle and Captain Walter Rybka, Site Administrator and Senior Captain of the Niagara, will share the history of its recovery and restoration. Pennsylvania’s Quakers had long opposed slavery and the Gradual Emancipation Act of 1780 led to establishment of the abolitionist movement. The Underground Railroad which helped escaping slaves travel into Canada was supported by many citizens of the commonwealth. Thaddeus Stevens was an opponent of slavery in the U.S. Congress in 1859 and lived with his African American housekeeper and companion in Lancaster, Pennsylvania. Excavations at the Thaddeus Stevens and Lydia Hamilton Smith site have led archaeologists, James Delle and Mary Ann Levine, Archaeology Professors from Franklin & Marshall and Kutztown University, to speculate that modifications to their home may provide evidence that it was used as a hiding place for fugitive slaves. 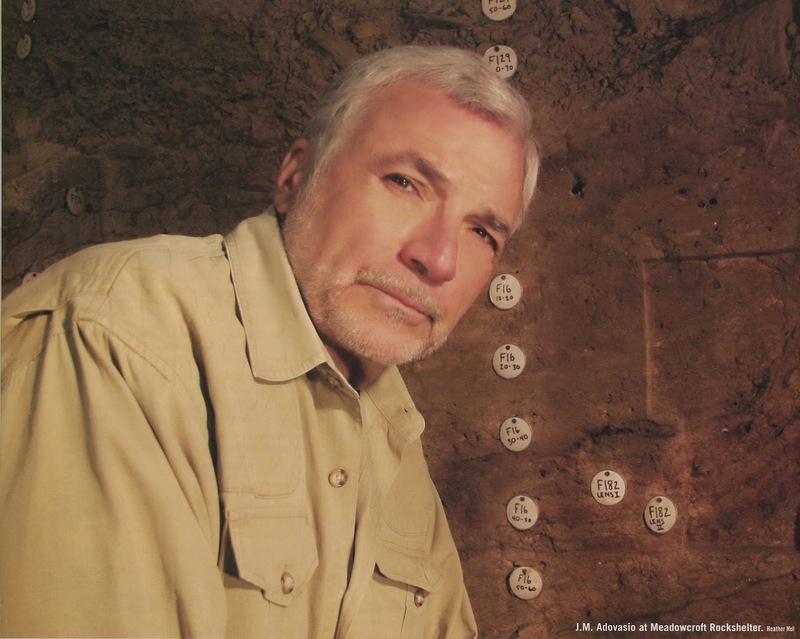 John Roby, Professor at Indiana University of Pennsylvania (IUP) will share his research of an archaeological investigation at a free African American homestead in Susquehanna County. The Dennis Farm was established in 1793 by Prince Perkins, a free African American from Connecticut after his service in the Revolutionary War. This farm has remained with the same family for seven generations. Peter F. Rothermel’s painting “Battle of Gettysburg: Pickett’s Charge"
The Civil War found Pennsylvania again playing an important role in supplying ammunition, guns and clothing to troops. Iron and steel were the leading industries, producing about half of the nation’s iron. Three times Pennsylvania was invaded by southern forces- each time they were defeated and driven out, protecting the other northeastern states. The Battle of Gettysburg is considered the major turning point in the struggle to save the Union. Nearly 350,000 Pennsylvanians served during the Civil War and nearly a third of General Meade’s army who fought at Gettysburg were Pennsylvanians. 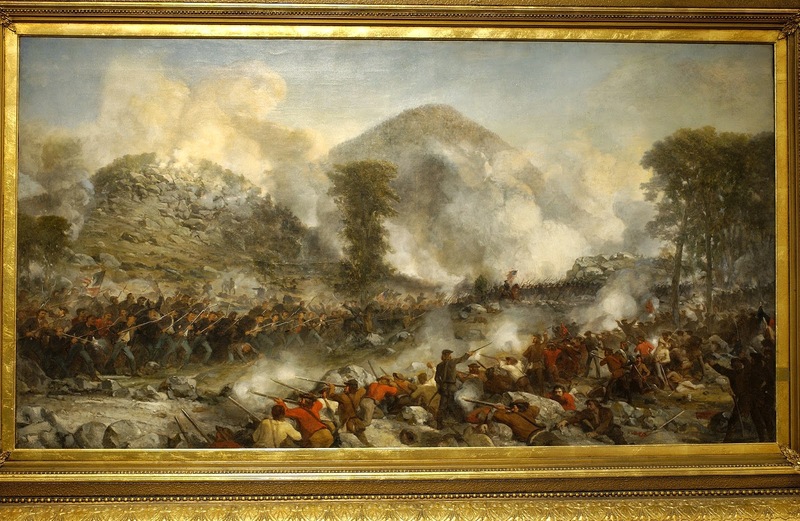 Ben Resnick, Archaeologist at GAI Consultants, will share his research into the analysis and interpretation of a Civil War battlefield burial and the treatment of these remains. Archaeologist Judd Kratzer will summarize the day with closing thoughts and provide an opportunity for participants to ask questions. Additional venues available throughout the day will include an artifact identification session, an opportunity to complete archaeological site recording and two informational programs with Steve Nissly, a highly skilled flintknapper and John Heckman, a Civil War historian and reenactor. The day will end with a wine and cheese reception in the Anthropology and Archaeology Gallery of The State Museum. We hope you can join us for this program which is our speakers have prepared as a presentations geared towards the general public to share in their archaeological discoveries. Preserving our archaeological heritage is important for future generations and understanding what archaeology contributes to our past, enables us to make good decisions about preservation. Don’t forget about the other Archaeology Month opportunities going on throughout the state this month. Here are two flyers for programs in the Philadelphia area you won’t want to miss. 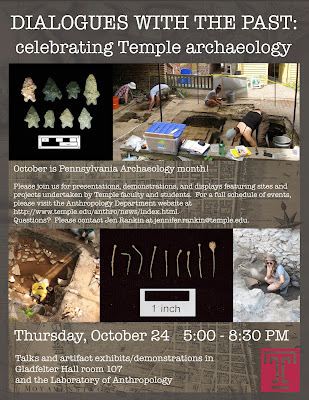 Join us as Temple University’s Department of Anthropology and Anthropology Graduate Student Association host Dialogues with the Past: Celebrating Temple Archaeology. This program will highlight recent research by Temple’s students and faculty, offering a broad range of topics to enlighten participants in the archaeological heritage surrounding Pennsylvania and nearby regions. 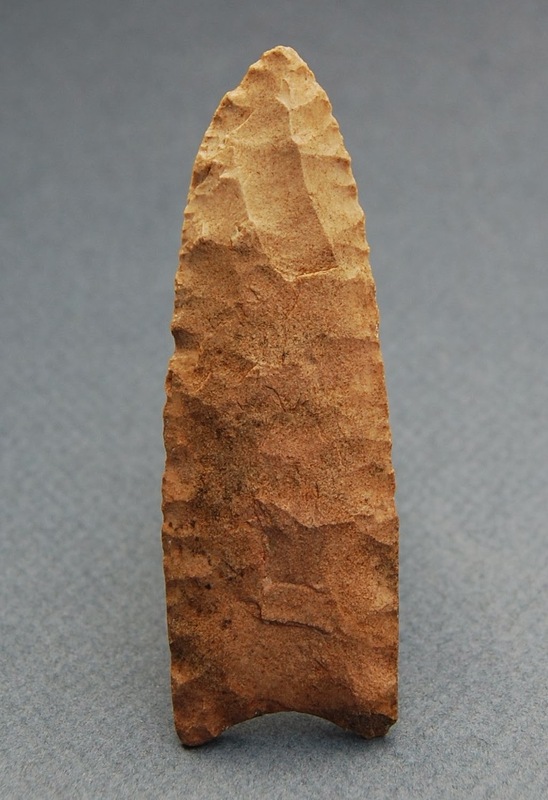 Research topics will include archaeology conducted at Native American sites from the Paleoindian period to European Contact, as well as historical archaeology conducted at Brandywine Battlefield, Valley Forge and Elfreth’s Alley (http://elfrethsalleyarchaeology.blogspot.com/). Artifacts associated with these excavations will also be on display. The public is invited to attend this free event from 5pm to 8:30pm on Thursday, October 24th in Gladfelter Hall on the Temple University’s main campus (http://www.temple.edu/maps-and-directions). An opening reception will begin in the Anthropology Lab at 5pm, followed by student and faculty presentations in Gladfelter room 107. The event will conclude with an opportunity to interact with Temple researchers and view artifact exhibits and demonstrations. For questions and a detailed schedule, please contact Jen Rankin (jennifer.rankin@temple.edu). Make sure to visit our blog about the happenings of the Anthropology Lab at Temple University (http://anthropologylabtemple.wordpress.com/). We hope to see you soon at the Workshops in Archaeology or one of these other wonderful venues! The black plastic covers our excavation block,preserving our investigation till next year. The expression that all good things must come to an end seems quite applicable this week as we close up the site at Fort Hunter for another year. The black plastic has gone down over the exposed level and our dirt piles will fill in the excavated areas, just waiting for our return next September. Indian Festival Day is over and the last soil profile at Fort Hunter was drawn. It is time to recap the season and begin to review and analyze our filed notes, feature records and photographs. Artifacts will be washed, cataloged and analyzed in the lab this fall to look for artifact distribution patterns that will aid us in interpreting the use of this site. As is usually the case, the last week of any archaeological field project is filled with a flurry of activity trying to complete the necessary floor maps, wall profiles and feature forms. The last week also frequently ends with a surprise. Everyone wanted to help screen the dirt at Indian Festival Day. Sunday, October 6th was Indian Festival Day at Fort Hunter Mansion & Park. This program features education programming focused on Native Americans. It is a popular program for local scout troops and many of those groups as well as others visited the excavation. It is also an opportunity to observe flint knapping, cordage making, chopping wood with stone tools, face painting and eating Indian foods and experience the thrill of throwing the atlatl. About 600 visitors enjoyed the various activities this beautiful setting has to offer. Indian Festival Day was an opportunity to share the large block excavation unit with our curious visitors. What are we looking for? Why are we digging here? How did we know to dig here? These are some of the questions visitors ask while observing our excavations. Of course, we always respond that we are looking for a fort dating to the French & Indian War. We are digging here because our historic documents and ground penetrating radar indicated potential areas for investigation. The support and interest of visitors and volunteers is always encouraging and is a big motivator to continue this investigation. For the past three weeks, we have been working in the front yard uncovering and mapping the cobble/pebble feature associated with a hardpan soil that is at least 45 feet wide. This has been interpreted as a road (or ditch) but we do not know if the total width was being used at one time or were there different segments being used as conditions changed over time. Did it date to Colonel Clapham’s 1756 path that he took to Fort Augusta in present day Sunbury or was it a later version of this road? The plan was to cut a five foot wide, 45 foot long trench across the road in order to recover artifacts to date this feature. Monday it rained and more was predicted for late in the week so the pressure was on to complete the necessary work. By Wednesday, surprisingly few had been found. The most common artifacts from the historic period were heavily rusted pieces of iron (referred to as iron blobs) that were nearly unidentifiable but probably represent nails, spikes or bolts. However, the most common artifacts were prehistoric in age. These were primarily chert flakes but near the end of work on Wednesday, one of our loyal volunteers, Jerry Botdorf from McClure, Pennsylvania, recovered an unbroken projectile point that represents a classic example of the Otter Creek type. This would place the soil on which the road rests as early Late Archaic or late Middle Archaic in age. Last year while testing the hardpan with a soil auger, we recovered a Brewerton side-notched projectile point and this would also be dated to the same period. The added significance of Jerry’s find was that it was located less than three feet from a charred piece of wood that can easily dated by radiocarbon analysis. The Otter Creek point type is not common in Pennsylvania and has been variously dated between 5200 and 6600 BP. Although not from an ideal context, such as a hearth, a date from this piece of charcoal could contribute to a more precise dating of the Otter Creek projectile point type. We screened a lot of soil this week hoping to find datable artifacts reflecting the age of the road. Finishing the transect was only accomplished with help from our many volunteers. This week, we had Shelia Dunn, Kim Sebastian, Marissa Seidel, the Strauss family – Clydene, Stephaney and Steve and the Finnegan family - mother Erin and her twin daughters Keara and Kaela. The Finnegan’s came after school every day (the girls are in 7th grade) and took Wednesday off from school to help us and even brought their cousin Masyn and aunt Margy Finnegan to help. These budding archaeologists were very dedicated and plan on coming out next year. As our followers in the Middle Atlantic know, the rains began on Thursday. We worked most of the day completing the trench, mapping the units and profiling the walls but were soaked to the skin. Knowing the rain was going to continue, we packed up all of our equipment, laid down the plastic and closed the site until next year. Over the next several months, we will be developing maps of the various features we recovered this season and analyzing the road/ditch feature in relationship to other features in the front and side yards. This process will help us to more clearly interpret this feature and plan for additional investigations next fall. Our project at Fort Hunter is just one of our Archaeology Month activities and there will be several more between now and Thanksgiving all for the purpose of increasing awareness of the public in our archaeological heritage. Understanding and appreciating your heritage is important for many reasons, but primarily that sense of place and heritage is something to which everyone can relate. Preserving our archaeological resources for future generations helps to insure that our heritage isn’t lost and that we can continue to study and learn from our past. Speaking of our heritage and researching the past, students from Temple University will present Dialogues with the Past: Celebrating Temple Archaeology! This program will highlight the work of Temple’s researchers and is sponsored by the Anthropology Graduate Student Association and Temple University’s Anthrolopology Learning and Research Center . The public is invited to attend this free event on Thursday, October 24th in Gladfelter Hall on the Temple campus. Archaeology Month continues throughout October with many events throughout the state. Here is the link for the Society for Pennsylvania Archaeology Month calendar; http://pennsylvaniaarchaeology.com/archaeology-month/ . We are highlighting just a few of these events, but encourage you to seek events in your community. This weekend, October 12th & 13th, members from John Schrader Chapter 21 will be at Joanna Furnace for the Apple Festival (http://www.haycreek.org/ ). They will have a small exhibit and excavating the Wheelwright Shop site at Joanna, weather permitting. North Fork Chapter 29 will meet on Friday, October 18 at 7:00 p.m. at the Heritage House, 4 Sylvania Street in Brookville, PA. Ken Burkett will present the program “Wildcats at War: The 105th Pennsylvania Infantry”. We will be on the road October 26th at Cabela’s in Hamburg, PA. This event is an opportunity to meet with members of the Society for Pennsylvania Archaeology and view the artifacts and site information from several local area chapters. If you've seen our blog and always wanted to sit in the dugout canoe but have not- here’s your chance. 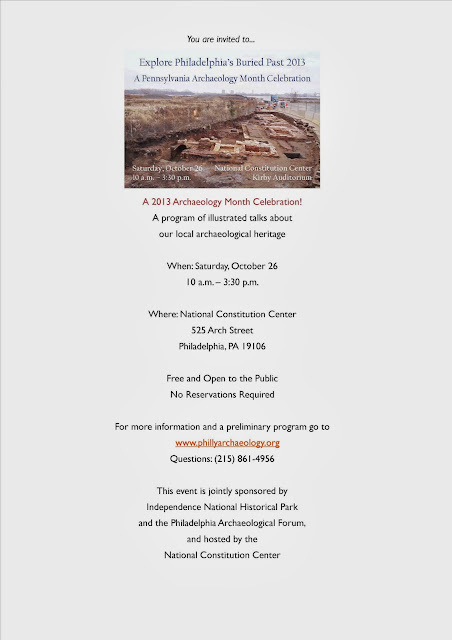 October 26th is also the date for the Philadelphia Archaeological Forum event, Explore Philadelphia’s Hidden Past: A 2013Archaeology Month Celebration at the National Constitution Center. This program is free and open to the general public. We hope you will join us and our colleagues at one of these worthwhile events and learn more about your archaeological heritage. Remember to register for the Workshops in Archaeology program - early registration deadline is November 8th! Shovel Ready- Learn at Lunchtime- October 4th !